Schlemmer offers a wide range of product at different price points so you are sure to find something for everyone on your list and much, much more. The elves at Wrapped Up N U to work with Hammacher Schlemmer to bring two wonderful products to light this holiday season. Over the last few months, we developed a love of mangos. we were buying what seemed like tons of frozen mangos and eating them right out of the bag. What could make these frozen mangos even better? 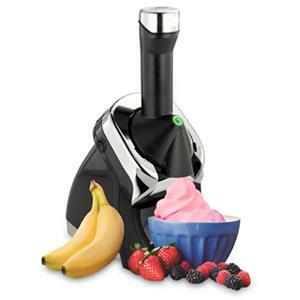 The Yonanas-Best Frozen Dessert Soft Serve Processor of course! We really like the fact that the soft serve is so much better for you and you know exactly what goes into it. It's easy to use and the parts are dishwasher safe. It's like ice cream without all the guilt, sugar, and fat. This has been a turn blessing to these elves from the south, we can't wait to see all the different flavor creations we can come up with from the recipe book or making our own. The motor is strong and showerful, yet very quite. You will never look at ice cream the same way. The elf children love it and so do daddy and momma elf! We highly recommend this and may other items from Hammacher Schlemmer. Can't decide? They also offer Gift Certificate. Unlike a juicer, The Best Frozen Dessert Soft Serve Processor does not separate the fiber from the fruits or vegetables, so the user gets 100% of the food's nutritional benefits. The Best Frozen Dessert Soft Serve Processor does not require any milk, yogurt or cream. Vegans, diabetics and those who are lactose intolerant can safely enjoy healthy frozen treats that look and feel like ice cream. With multiple safety features, children can participate in preparing along with adults. The Best Frozen Dessert Soft Serve Processor is easy to use, easy to clean and dishwasher safe. The Best Frozen Dessert Soft Serve Processor comes with The Hammacher Schlemmer Lifetime Guarantee at no additional charge. If this product ever disappoints you, for any reason, you may return your Hammacher Schlemmer purchase for exchange, credit, or refund. Should you have any questions, we are available 24 hours a day, seven days a week. Please call 1-800-321-1484 to speak with a product specialist or email us at customerservice@hammacher.com to receive a response within one hour. A disclaimer and disclosure: * I received one or more of these product in exchange for a review. I was compensated with product or payment for my reviews, however, all my opinions are my own, based on my personal experience with the product. I am disclosing this in accordance with the Federal Trade Commission’s 16 CFR, Part 255: Guides Concerning the Use of Endorsements and Testimonials in Advertising.